Our Tents are on Sale Right Now! The Discount will not show on the shopping cart. The price reduction will be taken when we write the order up at the office. Please call us if you have any questions. 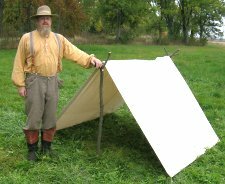 Our "A" Frame Tents are constructed of the highest quality canvas available for civil war reenacting. Treated for resistance to the elements and boat shrunk, your tent will last for many years. We use 10.38oz Sunforger canvas as well as treated thread to ensure the best product. Our "A" tents are standard 6 or 7 feet high at the ridge, and 8 feet 9" wide at the base. Two cots will fit fine and have room in between. We can make any size tent, taller, longer, etc. as well as add an extra door, sod cloth. etc. Please inquire. The tents below are our normal stock items. Poles, ropes and tent stakes are not included with our tents. We will provide an instruction sheet for making the poles required for the specific tent (usually one 2 X 4 and two 2 X 2's). You may add tent stakes to your tent, or purchase them separately below. Note that we use 36" panels on all of our tents. There can be some variation in width, which is common in canvas. In addition, our canvas overlaps by approximately one inch per seam when sewn. This causes the actual tent to vary by a few inches by the time it is sewn together. This usually affects only the length due to seams, etc. This is an industry standard and is common among all professional tent makers. 9' long "A" Tent, 6 Feet tall, 8' 6" wide. Sunforger treated canvas. Standard Size A tent which will accommodate 3 people and all of their "Stuff". Can also sleep 4 people if needed. Two cots will fit into this tent with room at the end for the extra camp gear. Webbing loops along the bottom and one in the center of the back. Reinforced ridge corners. 8' 6" wide. Sunforger treated canvas. Same as above, only with double doors. This design is great for hot weather events where extra ventilation is a plus. Also good where there is limited access and you can use either end for entry. Webbing loops along the bottom and one in the center of the back. Reinforced ridge corners. 9' wide. Sunforger treated canvas. Same as above, only with double doors. This design is great for hot weather events where extra ventilation is a plus. Also good where there is limited access and you can use either end for entry. Webbing loops along the bottom and one in the center of the back. Reinforced ridge corners. 6' long "A" Tent, 6 Feet tall, 8' 6" wide. Sunforger treated canvas. Webbing loops along the bottom and one in the center of the back. Shorter in length, but it is easy to sleep sideways in this one. For two doors and/or sod cloth on this tent, please give us a call. 7' long "A" Tent, 6 Feet tall, 8' 6" wide. Sunforger treated canvas. Webbing loops along the bottom and one in the center of the back. This tent is the right size to match tents made by Yakima Tent Company, which are slightly shorter that the standard Civil War Reenactment tents. Reinforced ridge corners. Tent Stake Puller. 20" long. Hand forged with a twist in the center and forged handle with a hook on the end to grab the stake. Makes it easier for us older folks to pull stakes at the end of the event. This goes onto a vertical tent pole 2" X 2" and hugs the pole enabling a light fixture or other item to hang approximately 8" out from the pole. Uses lever action, so the heavier the item, the tighter it grips. These are approximately 11" long over all and are hand made in the USA by our competent (well he's usually sober) blacksmith. We can also make any size sutler tent for you. Please contact us for a quote. 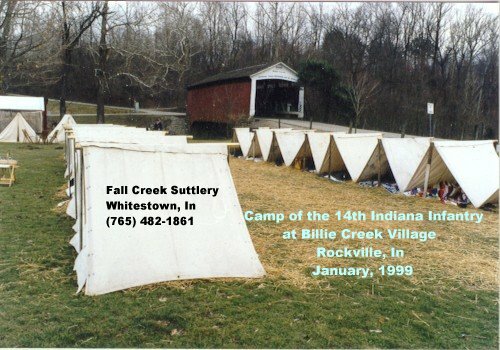 Fall Creek Suttlery Makes The Finest Civil War Reenacting Tents Available! Our Wall Tents are made from 10.38 oz Sunforger treated canvas which is the same material as our "A" tents. All of our larger tents feature double stitched seams throughout and plenty of reinforcements wherever needed (We do not over reinforced just to drive the price up). These are the best tents on the market and satisfaction is always guaranteed. Standard Wall Tent, 12' long, 10' wide, 7' tall. Walls are 41" tall. This is by far our most popular wall tent. Double stitched seams throughout with reinforcement in all corners and at grommets. Also features a cord reinforcement along the sides for stability. 10.38 oz Sunforger treated canvas. Has a brass grommet at each end of the peak, and 5 grommets along each side at the top of the wall. All grommets are ring-spur for stability. Overlapping doors for privacy (4" overlap) with ties inside and out. Ridge is vented at each end for safety and to keep your living quarters fresh. Webbing stake loops along the bottom of each side and three in the back to keep the sides steady. For a Tent Fly (See Below) add $169.95, Fly can use up to 10 stakes. Poles, ropes and tent stakes are not included with our tents. We can provide an instruction sheet for making the poles required (2 X 4's and 2 X 2's) for the specific tent. You may add tent stakes to your tent order, or purchase them separately below. Stove Hole (specify diameter of pipe) $100.00. Note that we use 36" panels on all of our tents. There can be some variation in width, which is common in canvas. This could cause the actual tent to vary by a few inches by the time it is sewn together. This usually affects only the length due to seams, etc. For Fly (See Below) add $169.95, Fly uses up to 10 tent stakes. Two Doors and Sod Cloth are available for this tent. The Hospital Tents are not a stock item. Allow 2-3 Weeks for shipment. Fly for Wall Tent. Please click on the above link to view our fly's and the way that they can be used. Same as the Fly option in above Wall Tents, sold separately. Use over the tent or out in front. 12' x 12'. Double stitched seams with reinforcements where needed. Has five brass grommets on each side, and one in the middle of each end. 10.38oz Sunforger treated canvas. Our standard tent fly is the same size as the top of our large wall tent. Full scale. No Picture Yet. Our Shelter Tents consist of two halves that button together along the top to form a regulation size wedge shaped tent. Twenty two button holes and buttons per half. Made of heavy 12oz canvas. Design closely follows the original tents we've seen. Canvas is single fill duck, untreated. The 1864 style has become more popular due to its' larger size. The dimensions of each Shelter Half is approximately 64" X 64". Now as then, the width of the canvas can vary a couple of inches as it comes from the loom. We have been making this style since we began "Sutlering" in 1978. In fact, Shelter Tents and canvas gaitors were the first items that we hit the field with, creating the beginning of our business. I still have the first Home Sewing Machine that I used, and when I received the first order for 25 tents, I had to purchase our first Singer 16-188 industrial machine. It is still here and in use. Our standard Shelter Tent features a double sewn center seam and reinforcements top and bottom. Button holes are machine done and these tents use 4 hole pewter 5/8 inch buttons. We have always used brass grommets for durability. This style has been so popular, that even with our offering of the Shelter Halves without grommets, we still sell a ton of these every year. We offer both varieties so that you can decide which way you would like to go. We have Shelter Tents available without the brass grommets. These are made as above with our single fill 12oz canvas. Twenty two button holes per half. Eight buttons along the top edge only. Each half features two sets of reinforcements in the proper position along the bottom edge. Instead of brass grommets, there are finished holes at the reinforcements with rope for the stakes. If hand sewn button holes are desired, one can "Hand Finish" the existing rope holes at the bottom once you get the tent. 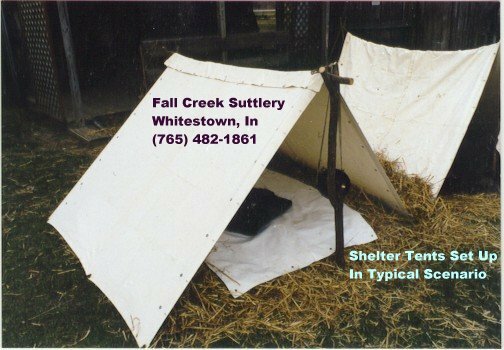 This tent is styled after one of the designs as pictured in the Federal Civil War Shelter Tent book as listed on our Books page. If only one half is desired, see the next selection down. Order End Closures by themselves below as well. M1864 Shelter Tent Half, Same as above, but one half only. Either with or without grommets, each half follows the description above. Shelter Tent half, with ropes......$44.50. Shelter Tent half, with grommets......$48.50. End Closure for our Shelter Tents. Buttons right onto the end of any of our Shelter tents. Made from the same material as our shelter tents. With the Civil War Sesquicentennial, we have a plethora of Neophyte Reenactors- This is a good thing. If there are issues with figuring out how the equipment functions or goes together, please do not automatically assume that the manufacturers (and/or Sutlers) who have been doing this for the last 20 - 30 years do not know what they (we) are doing. There are simple procedures for such things as Shelter Tents, Musket Slings, Cartridge Box Slings, Knapsacks, etc that can easily be worked out. Please read our links, or give us a call. In our opinion, Treated canvas is not necessary on Shelter Tents. After all, it is just a pup tent all buttoned together to help protect you from the elements, not a permanent structure. We do consider treated canvas necessary for the larger tents because, if wet or damp, untreated canvas will tend to mildew easily if stored improperly. If your shelter tent gets wet, it is very easy to hang this small tent somewhere to dry out once you get home. The "treated" canvas shelter tents available by other manufacturers is usually made from plastic or wax coated canvas. There are many products available for making your "untreated" canvas tent "water resistant". See your local hardware store. Going with the old adage that "the Customer Is Always Right (usually)" We do offer "Treated" canvas shelter tents that are made from the same material (10.38 oz Sunforger) as our larger Wall and "A" tents above. M1864 Shelter Tent - Treated, Sunforger treated canvas, as above with all buttons and button holes. These are sold per half or both halves. Each half requires 3 tent stakes per half. Shelter Tent with ropes.......$99.95 complete, two halves. Shelter Tent with grommets......$104.95 complete, two halves. Two halves are considered one tent. The selection below is for both halves (Treated Canvas). M1864 Shelter Tent Half, Treated Canvas, Same as above, but one half only. Either with or without grommets, each half follows the description above. Shelter Tent, with ropes......$54.50 per half.. Shelter Tent, with grommets......$58.50 per half. End Closure for our Treated Shelter Tents. Buttons right onto the end of any of our Shelter tents. This one is made from the same treated canvas to match the tents above. ****We have one slightly used Sutler Tent available. Size is 24' X 36'. This tent is used by us as our second setup tent. It has been set up only a few times. Top is 13oz Sunforger, and the sides are 10.38oz. The tent has a 3' X 3' roof vent with cover already installed. The end panels (24') are one piece, and the 36' sides (front and back) are two pieces, so there can be an entrance in the middle, both ends, one half or the other, or take the whole front down (and do any of the above in the back). This tent is just like new with a little dust. Uses three uprights in the center. No poles or ropes are included, but we can supply all of the needed details. This particular tent is available for a discounted price. Please call the shop to see what is available. We can ship this via UPS or save the charges and have it delivered to an event. I changed this listing a little because we sell quite a few of these tents per year, and a few had never been set up (Brand New). Please call and see what we have in stock. If the roof vent is not desired, or if we have no "used" tents available, This will have to be sold as a new tent. Please contact us if we can make a tent for you. Beware of dealers who refer to "Fire Retardant" canvas. There are some out there using "factory seconds" material. In order for a tent to meet the requirements of a "Flame Retardant" label, it must be made from first quality material and the tent placarded with the testing info. Our Warranty is simple. Satisfaction is guaranteed. If any of our items are unsatisfactory, please return the item in "as new" condition for a refund or credit. If the item has been used, but not abused, we will repair or replace at our option. Customer abuse, neglect or intentional damage is not covered. Wool Fabric is from Woolrich, 60" wide material, all first quality runs, no seconds or irregulars. Put up in bolts of 15 yds. You can buy whatever quantity you like in 1/4 yard increments. NOTE! !-Measure Carefully, Cut Pieces of Wool are not returnable.